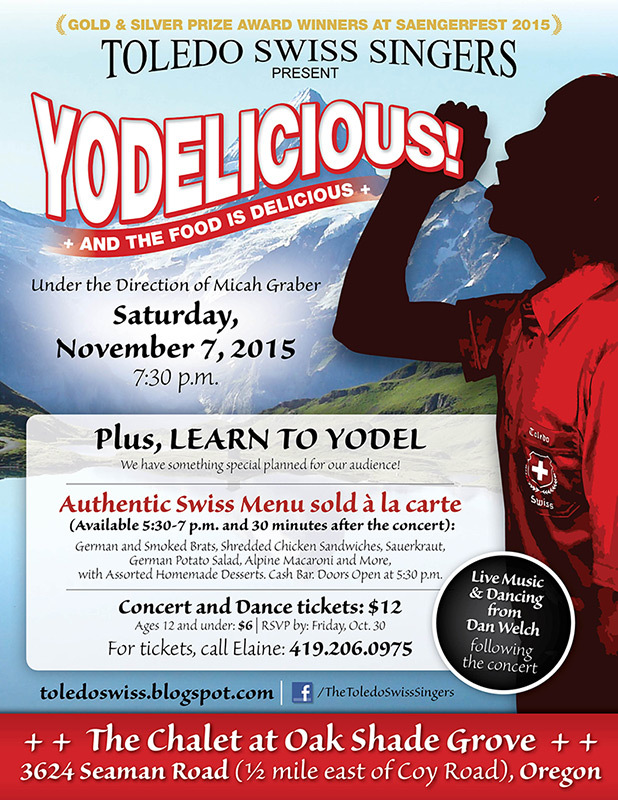 The Toledo Swiss Singers, one of the area’s oldest singing groups, will be teaching the audience to yodel Nov. 7 at their fall concert. Titled “Yodelicious!,” the concert will feature traditional Swiss and some recognizable yodeling songs, along with a tribute to Frank Sinatra’s 100th birthday. The evening begins with authentic Swiss food sold à la carte, available 5:30-7 p.m. and 30 minutes after the concert at The Chalet at Oak Shade Grove, 3624 Seaman Road in Oregon. The concert begins at 7:30 – and is followed by dancing to live music by Dan Welch. Concert and Dance tickets are $12, with $6 tickets for children 12 and under. The deadline for reservations is Friday, Oct. 30, with a few tickets available at the door. For tickets, call Elaine at (419) 206-0975. This is the first concert to feature the singers since their big win in June at Saengerfest, a competition, Swiss singing and yodeling festival held in New Glarus, Wisconsin, June 18-21. The group was awarded a gold prize for their mixed-choir German prize song “Waldeinsamkeit” by F. Abi. Ladies from the group were presented with a silver prize for their singing of the French song “Marine” by J. Mamie. The singers will open the Nov. 7 concert with these songs.